Tears, shouting, and insults, oh my! 3) Employ self-management techniques to diffuse flare-ups and maintain a sense of balance in difficult situations. 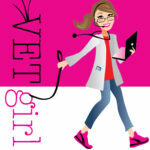 Not ready to sign up for VETgirl ELITE, but want to watch this webinar? For $20, you can attend this RACE-approved webinar - CLICK HERE to purchase access to this webinar. For time zone help, click here. * Purchase ($20/1 hour CE) will provide a 24 hour rental license for non-interactive, passive online continuing education. Great information, especially for younger/newer clinicians and staff who have not had much exposure to these situations. Thanks so much Barton. We’re having a few additional awesome topics by Jeannine Moga in 2016! Stay tuned to our 2016 online veterinary continuing education schedule!